Weekly Dance and Fighter Practices are held on Monday evenings. The next Baronial Populace meeting is on Sunday, May 19th at 7pm. 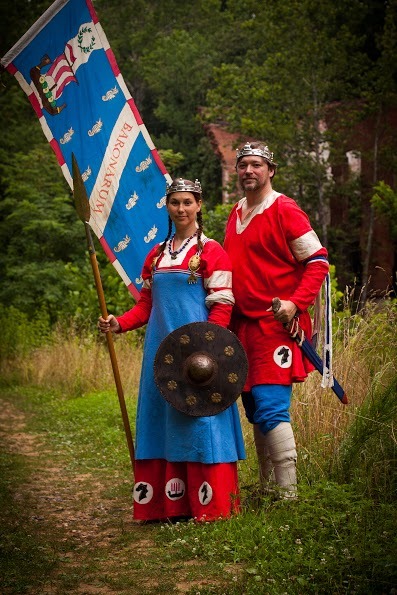 For details on all Storvik events, visit our Baronial Calendar. Welcome to the Barony of Storvik in the Kingdom of Atlantia. We are part of the Society for Creative Anachronism (SCA), a non-profit educational organization whose members’ research and attempt to recreate various aspects of life prior to 1600 A.D. The Barony includes Washington, DC; Prince George’s County, MD; and some parts of Montgomery County, MD. If you are interested in getting involved please contact our Chatelaine (aka our newcomer’s officer), and take a look at the Baronial Calendar to find an event to attend. We look forward to meeting you! The official communications channel for the Barony is our Google Group. Please join to receive regular updates from the Barony. The Barony’s Facebook page is home to lively unofficial discussion and an easy way to get in touch or ask quick questions. Or contact our Chatelaine—the officer who specializes in presenting information to newcomers to our hobby—or the Seneschal, the legal officer of our group.